A board portal is a tool that facilitates secure digital communication between members of a board of directors. Board portals are made for boards and for good governance. Board portals also typically include messaging features, voting tools, meeting, meeting minutes, agenda features and other tools to help make communication as seamless as possible. The right portal software for your business can simplify communication and help your board run efficiently. Board portal software, simply put, saves corporate secs and directors time. Evaluate your current board book solution and identify your pain points. A paperless board portal can bring security and eliminate shipping costs, for example. Decide what your “must-have items” are in a board portal like the addition of a secure messenger, D&O questionnaire help or 24/7 customer support. 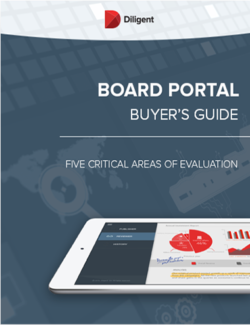 Utilize resources like our buyer’s guide to help you choose the right board portal software for your organization and board. Before the advent of online board portals, corporate secretaries were responsible for creating cumbersome paper board books and keeping them updated. As the technology continues to grow, be sure to choose a solution that provides the right tools for your corporate secretary to enable your board. A great way to make sure your board portal supports your corporate secretary is to see what solutions the board provider you choose is working to develop their roadmap. Security: How secure is the board portal? Security is the #1 worry of boards adopting a new technology, and with good reason. Hackers work 24/7 trying to break electronic security and gain access to an organization’s systems to spy, steal, or extort. Often, hackers are able to do this without a company even knowing its security has been compromised. If you want a secure solution, you need state-of-the-art security methodologies and encryption – not just another file management system for your board. Portal software allows a business to feel secure in knowing their confidential and financial information is safe – or at least it should. Make sure any potential vendor makes you comfortable with their security practices for your data. However, remember that even the most secure route must also be the most user-friendly or board members may try to find a (less-secure) workaround. Adoptability: How easy is the board portal to use and is there training available? If the app you choose isn’t adopted, it’s a wasted investment that may leave you less secure than you were before. For an application to be embraced by your board, it needs to be accessible from a multitude of devices, easy-to-use and accompanied by live support at any time. Having the ability to read and annotate board materials like you could do with a hard copy is comfortable and functional; an electronic board book should be as simple to flip through as paper, but with lots of additional advantages. A paperless board book is simpler for some and an easy switch but for others who have used printed board books for years, the right vendor will have options and training to help hesitant users jump in with two feet forward. The right solution for many organizations is easy for everyone to use and can provide better functionality than paper. Reputation and Service: How Is The Brand Received In The Board Portal Space And How Will They Be There For You? While there are dozens of electronic board apps to choose from, board portals are not a commodity. It’s like buying a car – while there are seemingly endless options, all cars are not equal. How do you know if the company you choose will actually understand your pain points and be able to solve your organization’s problems? Excellent customer service is necessary at the outset to train the administrator and end users, but this should remain a vital component on a continuing basis so that all users have the support they need to feel comfortable using the product. This is where it can be important to interview references from existing clients: sometimes the customer-service experience that may be advertised isn’t executed as well as you might like. Customer service awards – like the numerous customer service awards Diligent Corporation has – can also be a key indicator of how external, third-party groups view the customer experience a board portal provider will provide to you as a customer. Governance: Will This Board Management Software Improve Your Governance and Efficiency? Some portals provide solutions to improve corporate governance and efficiency. From viewing and signing documents to having the ability to vote on items and share notes with colleagues, apps with governance-focused features can help your board collaborate productively and securely. Having an app that allows board committee collaboration outside of full board meetings also frees up more in-person time for strategic work. Facilitating director evaluations on an app can also make that process less anxiety-inducing. Of course, a company that understands laws in your countries is also imperative. For example, discoverability is a major concern and a board app should be able to mitigate discoverability worries. The right solution for many organizations is a full-suite corporate governance solution that provides corporate governance solutions for global companies who have many active entities. Functionality: What Functions Are Available And What Functions Is The Company Building For Users? Preparing for a board meeting is time-consuming, let alone if you sit on multiple boards. Documents are frequently updated, but it can be confusing for board members to keep track of changes and manage note-taking effectively. Imagine logging in on your preferred device to prepare for your board meeting and receiving real-time notifications of any changes to your board book, along with any notes that may have been on edited or removed pages. Choosing if and how to share your annotations with others, or purge them, is another important capability. Basic functionality, like accessing your board books online or offline, and working on a computer operating update seem simple, but may not be offered by a potential vendor. Diligent Corporation provides companies with corporate governance tools to help keep them secure and compliant. 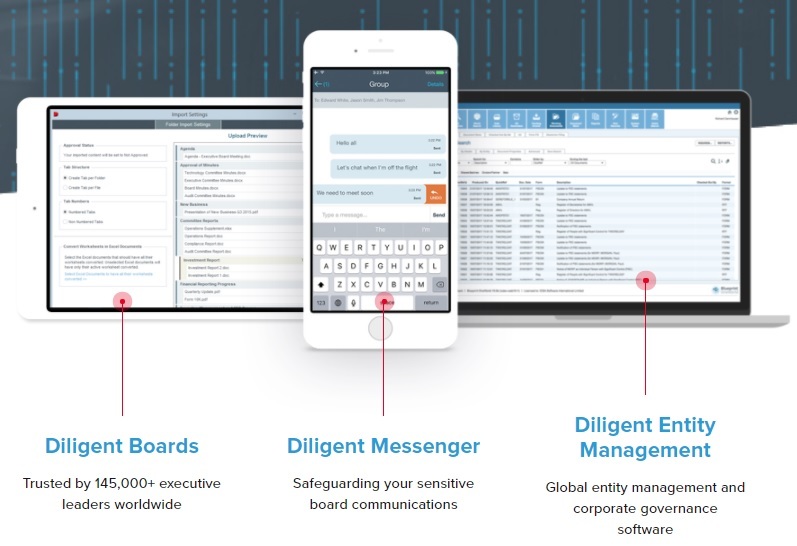 One of the core products in the Diligent product suite is Diligent Boards. A board portal is a secure platform, app or website that allows for a board of directors to share their board books – without the risk and added cost that a paper board book carries. Corporate secretaries can easily update books and secure communication between all parties – including notes, signatures, meeting notes, agendas and more – that can easily be shared. Learn the 5 essential qualities of board software.